There have been 254 images uploaded to this topic. (View topic image gallery). There are 682 posts in this topic. You are on page 13 of 14. Gottlieb: It's Not Just A Job, It's An Adventure. Congrats. Also, check if the big capacitors in the bottom are orange and/or light blue. If so they should be changed out. Looks like they are originals. I set it up tonight and got a better look inside. MPU is original, its the driver board that had been replaced. Definetly needs some connector attention. I tugged on a couple suspect wires and they came right out of the housing. Not exactly shiny either so i think its the best place to start. Pulled the mpu and used a pink pencil eraser on the edge connectors and voila. Game is alive and plays. Lots of small issues to correct like some switches not scoring and an upkicker thats not upkicking. Are there replacement edge connector housings that people use? And are there molex equivalents that use crimp contacts or are they just IDC’s? 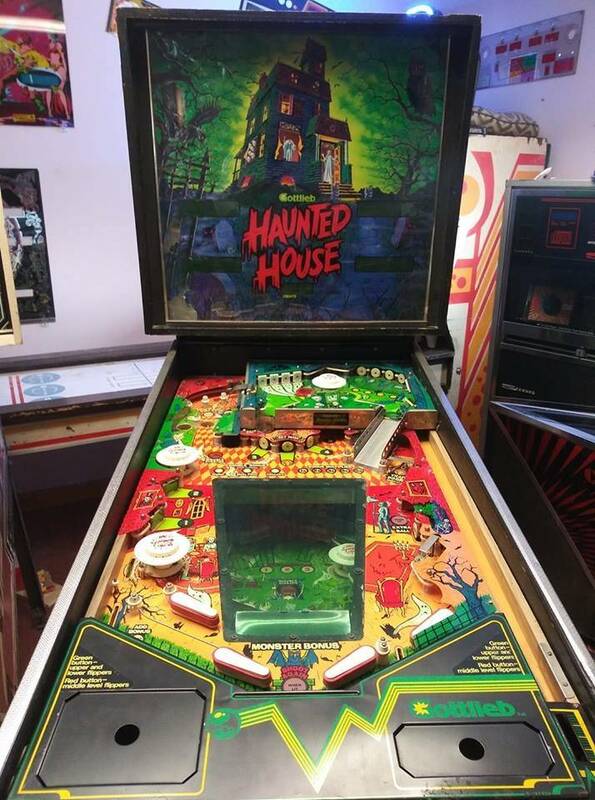 If you have an original coin box for your Haunted House can you post a picture of it? 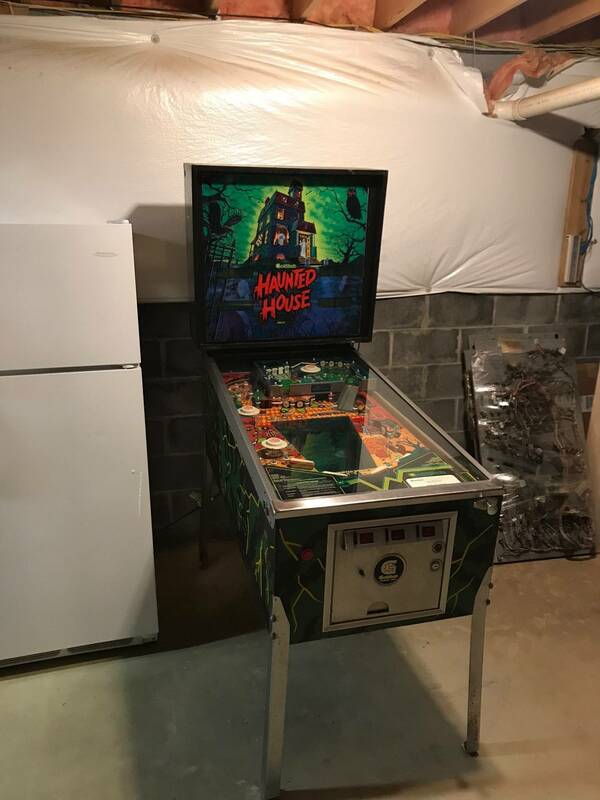 I've looked at a ton of Haunted House pictures online but none seem to show the coin box. I'd eventually like to find one for mine and would like to get the correct one. Dimensions would help. 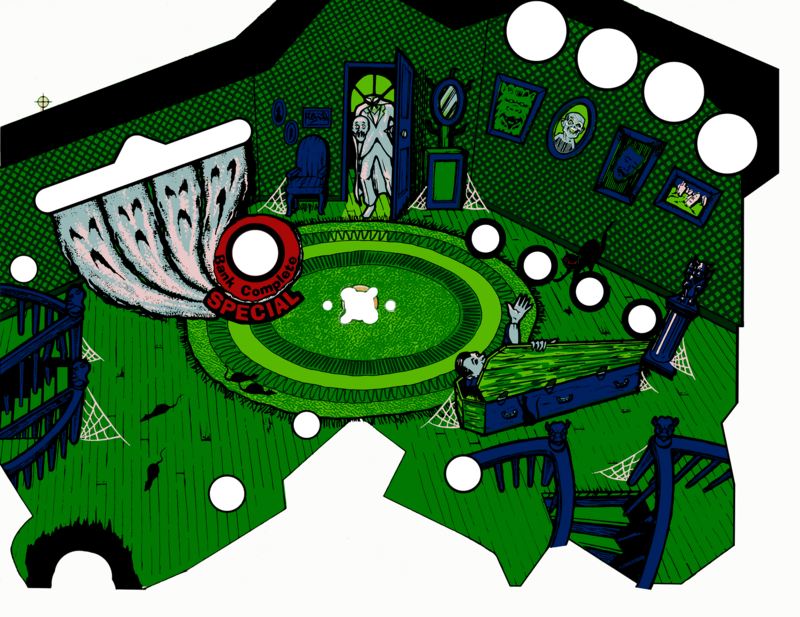 I am currently working on my haunted house and I am not sure what to do next. Just finished up ground mods and wanted to make sure jumping them all to this ground terminal block is ok. When I power it up all I'm getting is the displays alternating from 000,000 to 770,000 and nothing else. 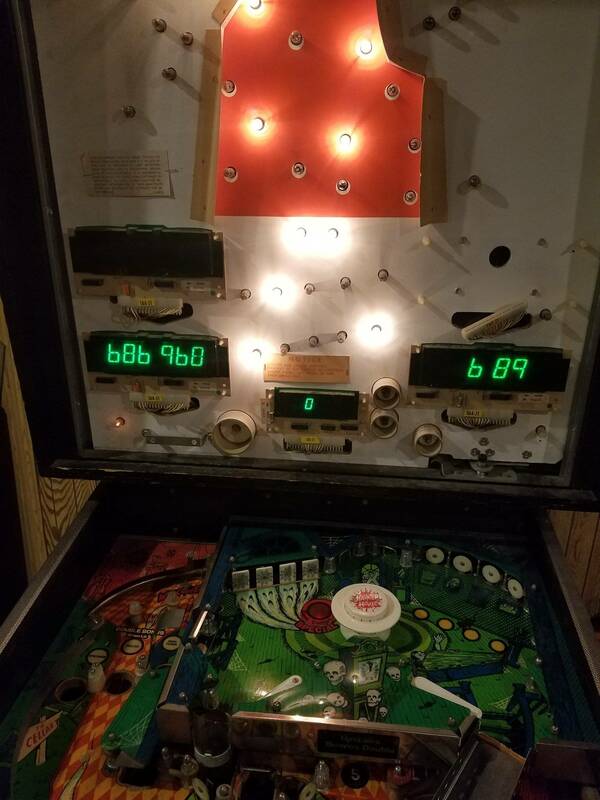 The first time I powered it up after getting it the lower playfield up kick coil burnt up and I haven't replaced it yet. Just not %100 sure what to look at next. Any help would be great. Alternating sounds normal operation, no? 770,000 to 000,000 is normal until you get higher than 770,000. When you say 'nothing else' do you mean if you have credits and hit start nothing happens? If you have a coil burnt/stuck it may not do anything until you remove it/replace it. Yea i can credit it up but nothing happens after. I will replace the coil (just waiting on part) and we will see what happens. Ahh this is my first encounter with HH so if that's normal its news to me haha. I can credit it up but nothing happens when I hit start. There are 3 relays way at the back right of the main playfield. They control the game basically. If these got bumped or stuck the game won't do anything. Do you get a big 'thunk' when you turn it on? Do any of the solenoids/switches work? Do the basement lights go on and off every 10-15 seconds? (They should under normal attraction mode). There is also music that will go every 20-30 seconds or so...but that might be a setting. Just throwing out things, but since you recently had them out, recheck your cables on the boards, and make sure you didn't accidentally pop the roms out. I’d be cutting that battery off of there if I was you. I remember when I got my first Gottlieb machine. In 1975. Loved Gottliebs ever since. Never a dull moment with the System 80/80A/80B era. 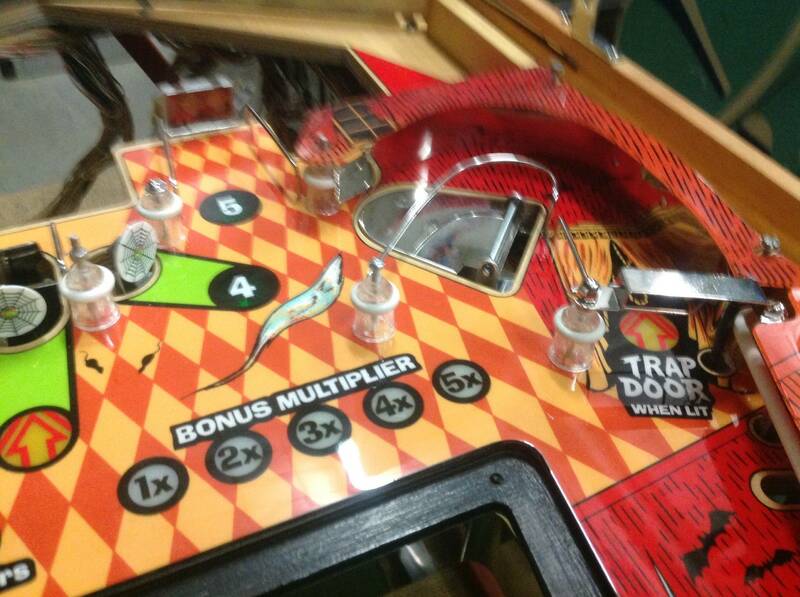 I just had a lamp go out under one of the inserts under the small attic playfield. 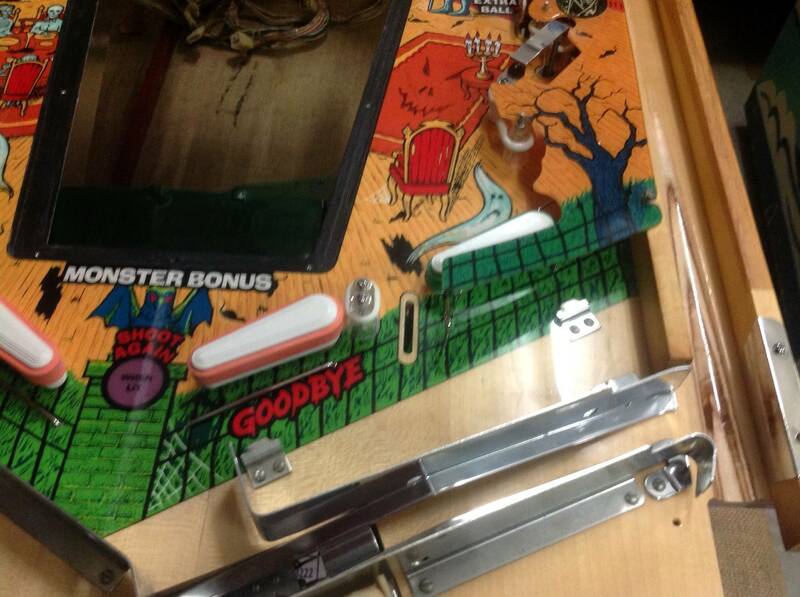 Is there an easy way to get to them or do you have to remove and lift off that upper attic playfield to get to them? I've never had to remove that yet. Is there anything to watch out for or any tricks to make it easier and safer to remove? 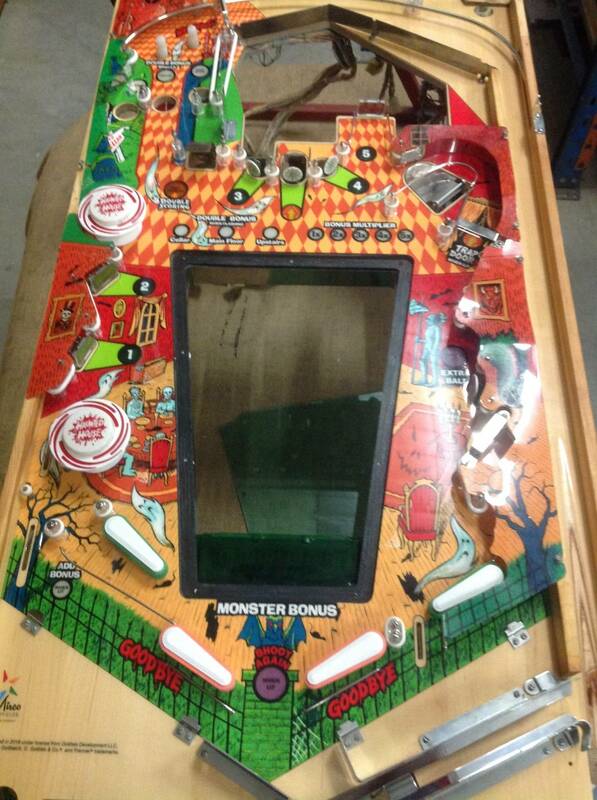 Just completed a playfield swap, if anyone is interested. You do but it is easy. On the front left and right sides of the metal frame you will see a divots in the metal, and there is a screw on each side. This holds the upper pf in place. You just have to loosen those (not take them all the way out). To get to the right one you will need to prop the main pf up a bit so it clears the cabinet. You also have to unscrew the bottom of the metal ramp that is attached to the main pf. Then it should just swivel up. Note that there are some short cables attaching it in the back of it - so you won't be able to completely lift it all the way up unless you disconnect those. In the back of the pf there are slots where the whole piece slides into as well. 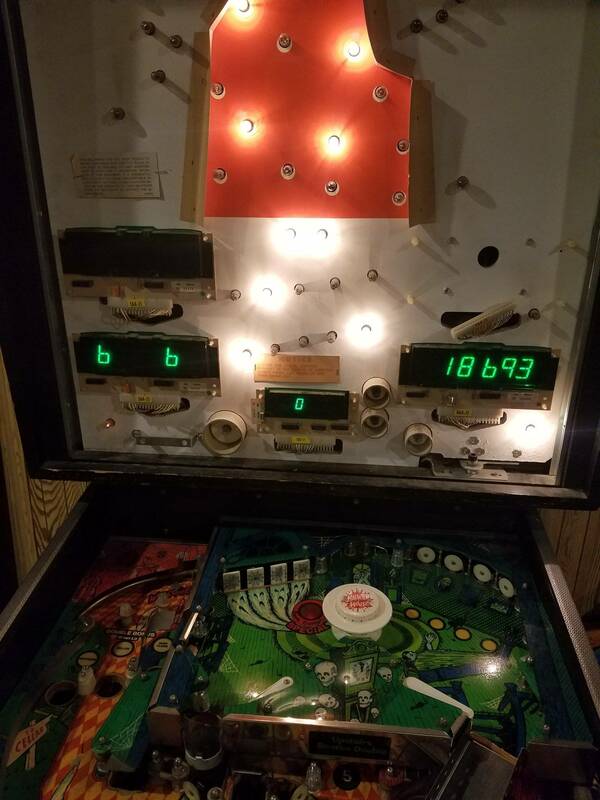 So I replaced the lower up kick coil, and found a blown fuse (F 14) on the underside of the playfield and still not getting anything. Same symptoms no thunk, no sounds, no basement lights, no solenoids/switches. My displays all work and gi and insert lights are working. I can credit it up but nothing happens when I hit the start button. Turns out F4 was blown as well! Got a thunk and it's up and running. Now I just have to figure out why the lower and upper pop bumpers aren't working and the lower pf up kicker still isn't firing consistently. Basement lights (pointing down from main pf) don't turn on either. There's always something! On these games, the pop bumpers each have a small, usually white-ish, board underneath. 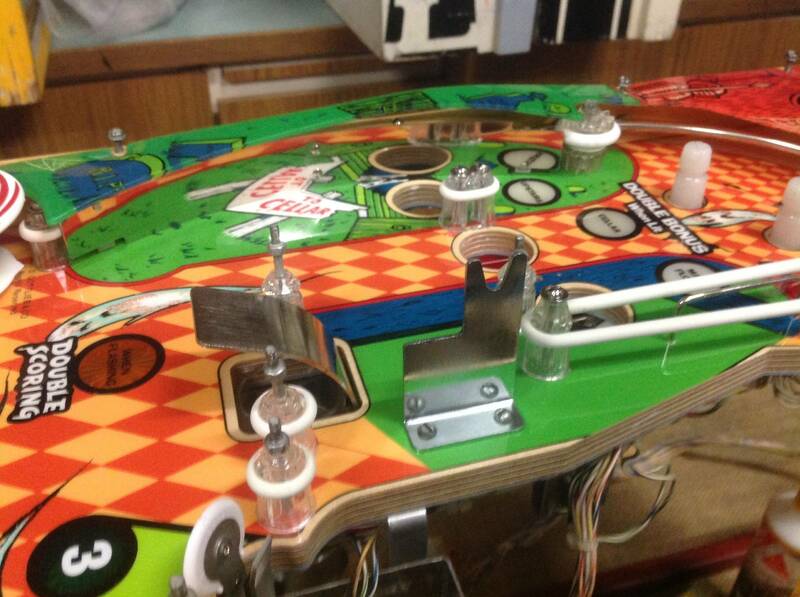 Find one of the boards associated with one of the working pop bumpers. 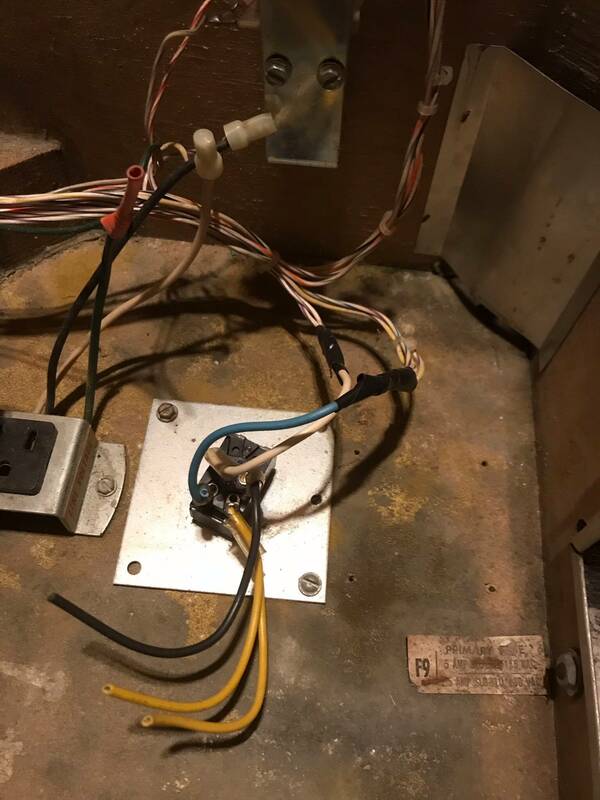 Then with the power off, take the board from the working pop bumper and plug it in where one of the non working pop bumper's board. Fire er up and see if the one that wasn't working is working now. If it is, then you know that its something on that board. Most people just replace those with new ones because they aren't that expensive but you can definitely fix the old ones. The basement lights are a very special bulb even though they look like all the rest. Its entirely possible that they are all burnt out, take them out and double check by looking at the filament. They are #313 bulbs. Thank you! I'll try that out tomorrow. Didn't know that about the basement bulbs either. The basement lights are not 5v or 12v they are 24v I think (i can look them up to validate, for some reason 23v comes to mind but that can't be right). It is possible someone put 47's in and they blew them. How does this K gate relay system work? I can't get the lower pf up kick to work, the #31 switch (up kick switch) is reading in switch test and I can manually get it to fire if I press the relay switch together but nothing happens in normal play. Wiggle the connector on the power supply, betting the 5 volts comes on, probably cold solder cracked. Thanks. I pulled the board last night and replaced the three 0.156 headers. Probably just pop in a new regulator since I had to desolder the old one to get it apart. Someone did prior work to it as well, CR7 and a few resistors have been changed. I got the power supply board rebuilt and reworking. Without the MPU installed I am getting attract mode sounds out of the sound board, I assume that is normal? Also my MPU is missing a ROM. Not a simple replacement from what I see, any suggestions? I do have a burner. can someone tell me the height of Haunted House?. I've scoured the forum but can't find it. Thanks. Add me to the club! Pics coming soon! This pin is begging to be modded. Specifically, im thinking ghost figures and possibly spiders or other "haunted" figures. Fresh apron cards from mikonos would be nice. Any suggestions for brand/type of ghosts? The rear left corner should get like a big rubber spider or something up there. When I had my HH I would occasionally get a ball up there bouncing around. Thanks! I will start looking for it! Hey guys. I'm dealing with a blown fuse every start up. 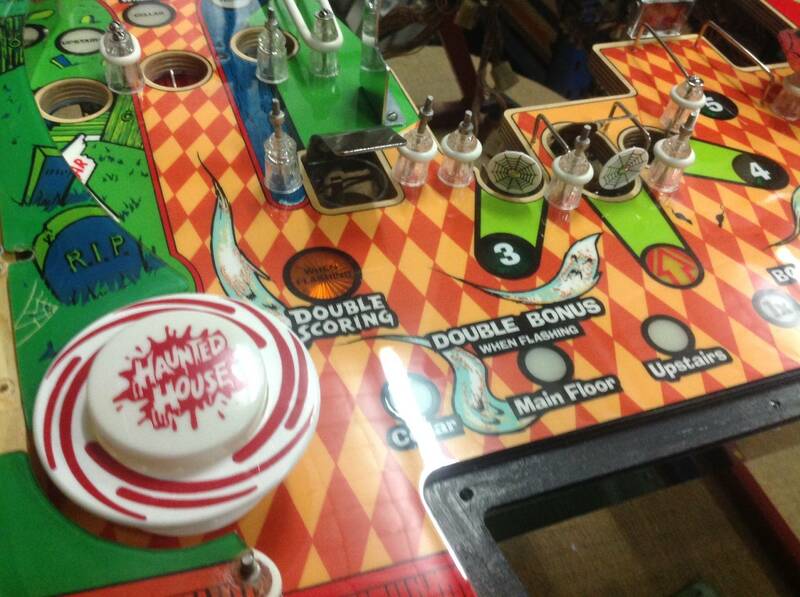 A lower playfield air ball sent the ball onto some coil lugs in an amazing 1 in a 1,000,000 shot and blew some goodies. Transistor Q21 was blown so I replaced that and snipped the coil diode to see if that would stop the Solenoid fuse from blowing. I assumed it was the right side kicking target (where the ball got stuck) so I snipped that diode. The fuse was still blowing so I replaced the IC that powers Q21 and fired it up but the fuse is still blowing. Can someone tell me what coil Q21 fires because I cannot find a list online or find it in the schematics anywhere. 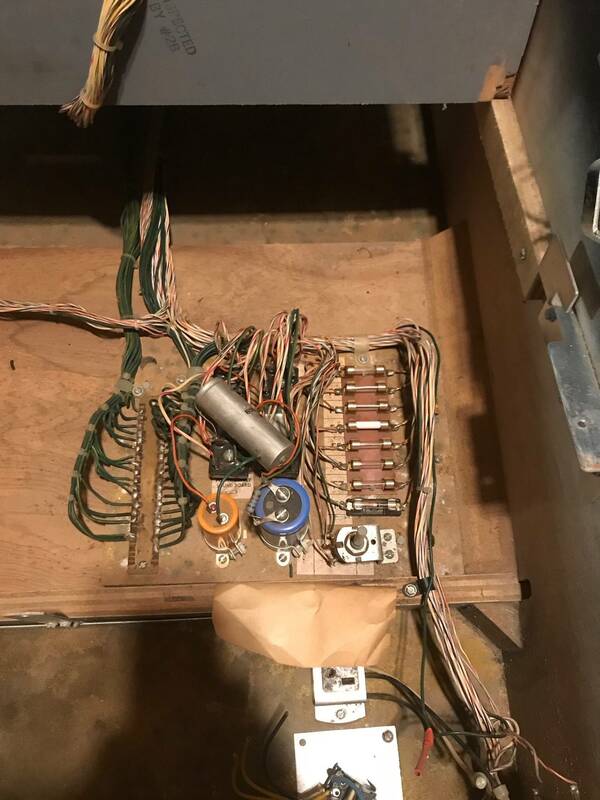 I did just find a post from 4 years ago that stated a bridge rectifier being out could cause the solenoid fuse to blow instantly and cause no sound. Which I am currently getting no sound so that very well might be the case. But can a shorted coil works its way down to the bridge rectifier or would that just be a massive coincidence? I swapped all 4 Bridge Rectifiers and that did not fix it. My problem has been fixed. And what did you do??? Hi guys, I've had this for few years and the wife was getting on me about getting it running. So I did the common repairs grounds, power supply, and put a rotten dog mpu. I was trying out a game when it went into the extra ball kick out and the game stopped and the displays just started showing these numbers. Did you replace the large caps in the bottom of the cabinet? 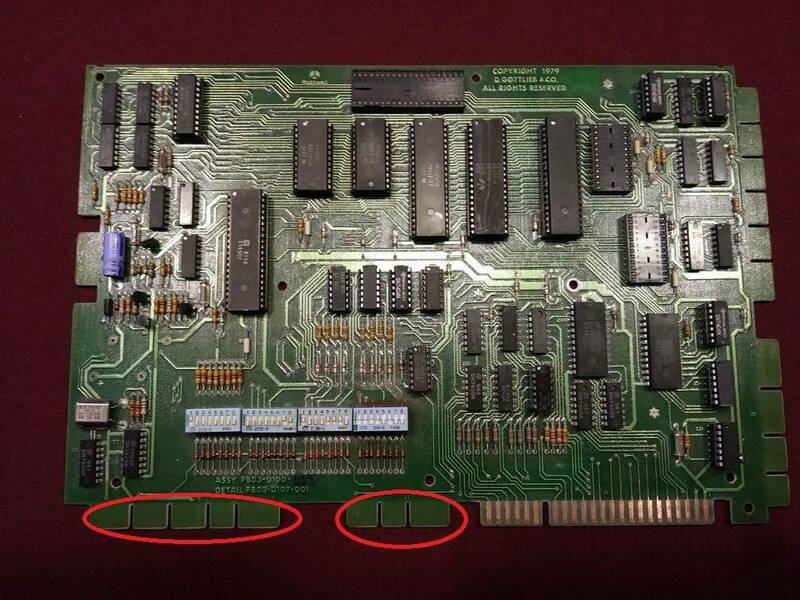 If you replaced the original MPU because of battery damage have you checked for bad pins in the connectors? What was wrong with the original board? I've fixed a few MPU and driver boards for these and a bunch of the sound boards. I just moved mine home and need to get it setup soon. You'll have a lot of fun with it once working and dialed in. Great playing game with great music! Yes I have replaced a both caps and brs in the bottom of the cabinet. replaced every bad pin I could find. The original MPU was wreaked all the way around to much work for a maybe fix. I did take it work and shot it with a dry ice blaster we use to clean carbon off switch gears. It did not survive lol. It had sat for 13 years from the guy I bought it from and lord knows long it was sitting before that. Having some problems with my sound, it goes in and out. Most of the time it just stops working completely.. Any thoughts? Thanks! This happened to me and it ended up being a connector on the sound board. Have you replaced those connectors yet? Okay, what connector did you order online? I'll try that and order one.. Thanks!